This series of photos of Hydrangea macrophylla in my front garden were taken just over a month apart, with the first made on June 20th, and the other two taken yesterday, July 25th. These hydrangeas, commonly called bigleaf or French hydrangeas, were planted by the previous owner, so I’m uncertain of their age. Sources say they should be planted where they don’t need to be pruned, except to trim away spent flowers. I felt they had grown out of proportion to other nearby plants, however, so I decided to take matters in hand and chop away. 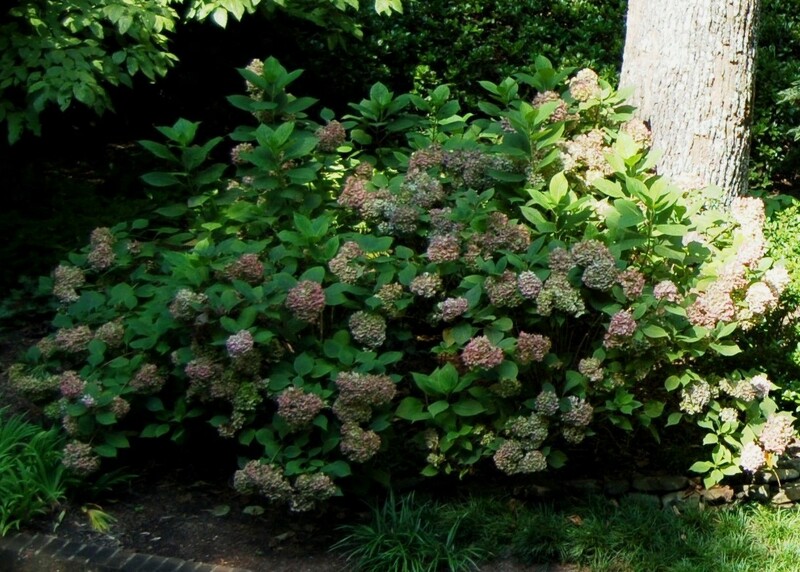 Experts recommend pruning Hydrangea macrophylla as flowers begin to fade by removing 1/3 of the oldest branches and then pruning the remaining by a third of their length. After following these instructions, I decided to push the envelope a bit, and ended up with branches roughly half their original length, or perhaps a tad less. Time will tell if this is a fix or a blunder. What do you think? 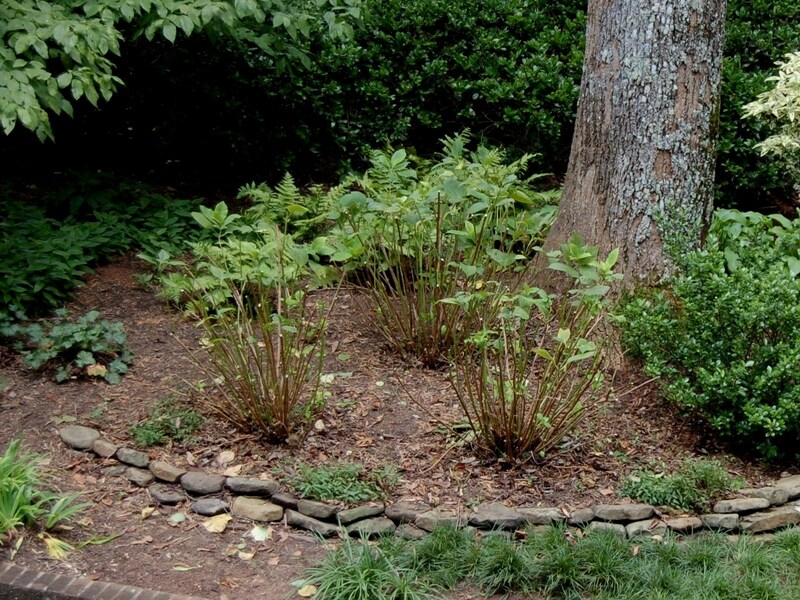 This entry was posted in Gardening and tagged Hydrangea macrophylla, pruning on July 26, 2013 by Marian St.Clair. Go for it, Doll. Sometimes you have to be ruthless in the garden. Marian, I have never suffered regret over any pruning or tree removal, after judicious consideration. Not once! I don’t know what your winters are like, but over here we leave the faded flowers on over the winter to protect the growing point from frost, then we just cut back to the first leaves when they emerge. When one by the kitchen grows to far over the path, this then gets chopped back in the spring, I think maybe you will have cut off the parts that would flower next year, but the year after, you should be ok.
Pauline–you very well could be right. The plants have bloomed nicely the past two years and I’m taking a risk with next year’s flowers, since this species blooms on old wood. I guess it is a question of how much regrowth they’ll put on before the end of the season and if they’ll set flower buds before they go dormant. I have no experience with pruning bigleaf hydrangeas so it’s a gamble! 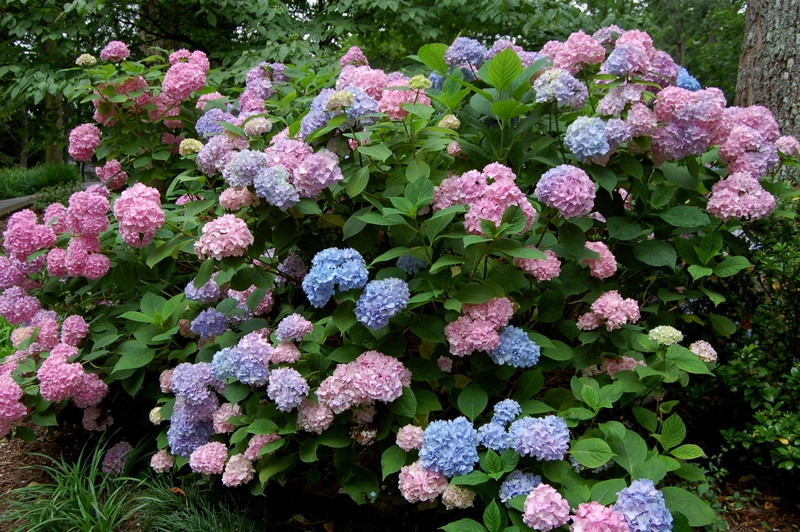 Janice–In time, I think I will replace these hydrangeas with a dwarf type. But there are so many other priorities in the garden, they are on hold for now. Barbara…you are a stitch! With the crazy weather we’ve had this year, it will be interesting to see when we get the first frost. I’m betting November. i have limited experience with hydrangeas, but when I’ve cut them back they always recover nicely, and I’ve cut them back almost to the ground. Jason–good to know. I’ve got fingers crossed! I’m all for proportion. They look great! You go, gal! Here’s Ginny’s gardening rule – “the plants don’t know what it says in the books”, so do what’s right for you at the time. You’ll have successes and failures, but that’s just how it is being a gardener, right? We all develop gut feelings for the rights and wrongs. I think you’re right! I heard from Pam Harper that one cuts the branches that have branched…they are already two years old, remove them. Others can be trimmed back after the blooms are spent, as long as there is still growing season left. Like you said–they bloom on old wood…so they need time to have growth after you prune them.